Yes, indeedy, the feds have placed both feet firmly in the new millennium. The Center for Disease Control is now using social media platforms to reach the masses. The CDC’s social media site contains links to their blogs, podcasts, MySpace, Twitter, YouTube videos and RSS feeds. 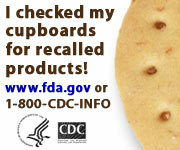 You can even download widgets to let you add updated peanut recall information to your website. Scroll a little farther down their page and you can also send eCards about recalls and other health topics to people you love. Nothing says “I love you” like a card telling you to check your cupboards or buckle up!